NSCA's Guide to Program Design offers the most current information, guidance, and protocols from respected scientists and practitioners with expertise in strength and conditioning program design. Developed by the National Strength and Conditioning Association (NSCA), this text offers strength and conditioning professionals a scientific basis for developing training programs for specific athletes at specific times of year. 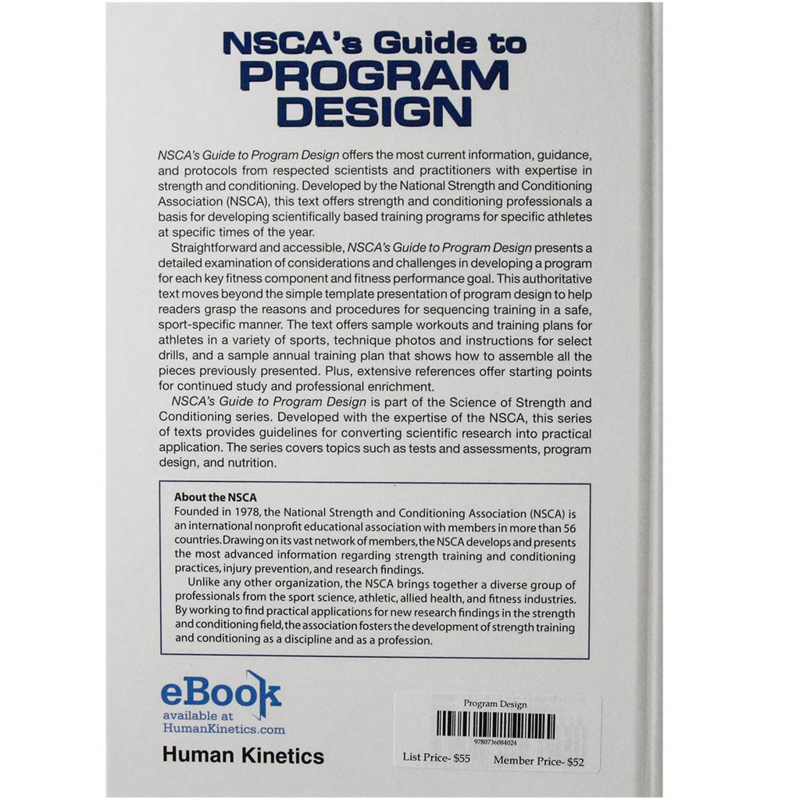 Straightforward and accessible, NSCA’s Guide to Program Design presents a detailed examination of considerations and challenges in developing a program for each key fitness component and fitness performance goal. Editor Jay Hoffman and his team of contributors have assembled an exceptional reference for practicing professionals and a valuable educational resource for new professionals and students preparing for certification. This authoritative text moves beyond the simple template presentation of program design to help readers grasp the reasons and procedures for sequencing training in a safe, sport-specific manner. The text offers 20 tables that are sample workouts or training plans for athletes in a variety of sports, technique photos and instructions for select drills, and a sample annual training plan that shows how to assemble all the pieces previously presented. Plus, extensive references offer starting points for continued study and professional enrichment. NSCA’s Guide to Program Design progresses sequentially through the program design process. It begins by examining the athlete needs assessment process as well as performance testing considerations and selection. Next, performance-related information on both dynamic warm-up and static stretching is discussed and dynamic warm-up protocols and exercises are presented. Then it reveals an in-depth, by-chapter look at program design for resistance, power, anaerobic, endurance, agility, speed, and balance and stability training. For each, considerations and adaptations are examined, strategies and methods are discussed, and evidence-based information on program development is presented. The final two chapters help you put it all together with a discussion of training integration, periodization, and implementation. In addition, a sample annual training plan illustrates how to integrate each of the key fitness components into a cohesive yearlong program. The fitness, safety, and performance of athletes reflect the importance of continued education in the science of strength and conditioning. NSCA’s Guide to Program Design helps bridge the gap between scientist and practitioner by providing coaches and other strength and conditioning professionals with evidence-based information and applications. Sharing the latest in proven research, NSCA’s Guide to Program Design helps readers remain on the cutting edge of athletic performance. 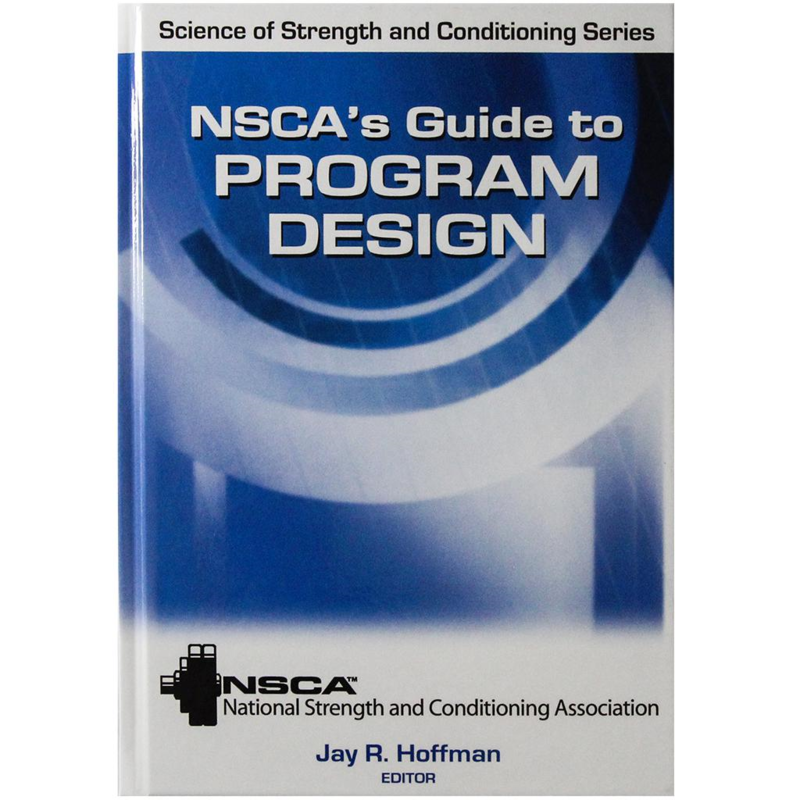 NSCA’s Guide to Program Design is part of the Science of Strength and Conditioning series. Developed with the expertise of the National Strength and Conditioning Association (NSCA), this series of texts provides the guidelines for converting scientific research into practical application. The series covers topics such as tests and assessments, program design, and nutrition.